Do you like walking and good food? Then our Happen & Stappen walk is for you! From 1 September 2015 until 30 April 2016, the tourist information in partnership with several cafés/restaurants offers a culinary walking route using the walking network. On this walk you will pass unique spots as well as establishments were you can treat your palate. Get to know our beautiful area, and during the darker months, you might need your torch. Looking for the ideal gift? The gift voucher 'Happen & Stappen' is now available at Mol tourist office. Depart between 11 a.m. and 1 p.m.
From 1 September 2015 until 30 April 2016. Only available on Monday, Saturday and Sunday. Happen & Stappen in the Molse Meren area is only available on Monday, Saturday and Sunday. Depart between 11 a.m. and 1 p.m.
35 Euros per person Drinks not included (unless otherwise stated), these are to be paid for on the spot. Booking compulsory, at least 4 days in advance. Looking for an active and delicious gift? 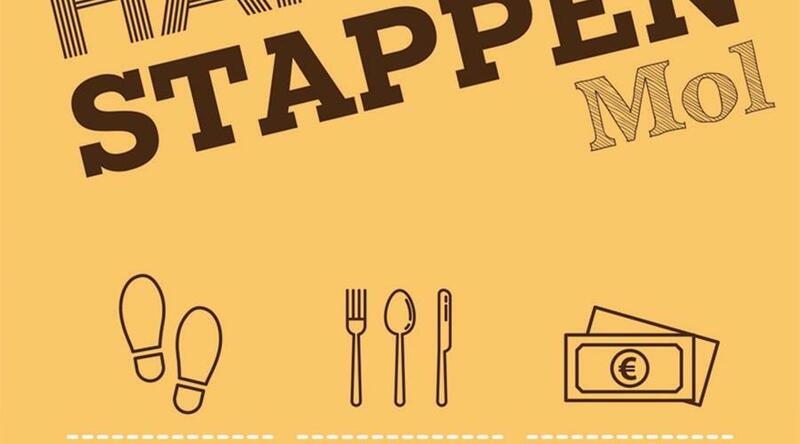 Consider our 'Happen en Stappen' gift voucher!